Jeju Island is a volcanic island located in the Korea Strait, just to the southwest of South Jeolla Province. It is the largest island in South Korea, and because of its temperate climate, volcanic rock, and picturesque coastline, it's usually referred to as "The Hawaii of Korea" and has become a frequent vacation destination, especially for newlyweds. Korea’s highest mountain, Hallasan, can be found in the center of Jeju Island. Hallasan is the island’s most prominent feature, and is actually a dormant volcano with an unusual shape; while it can be seen from anywhere on the island, its peak is usually obscured with clouds. A crater lake called Baengnokdam can be found at the top of the volcano--its name means "White Deer Lake," which associates it with the numerous legends and stories prevalent on the island. An extensive system of lava tubes on Jeju Island are popular tourist attractions and because of this, the island has been designated as a World Heritage Site. Among them is Manjanggul, considered as one of the longest lava tubes in the world and is highly regarded in terms of scientific value and global significance. Jeju Island is also unique in the sense that it is also its own province, officially known as the Jeju Special Autonomous Province, which is the first and the only special autonomous province in South Korea. The entire island itself is a World Heritage Site, and is included in lists like CNN’s 40 Most Beautiful Places in South Korea and CNN Go's 50 Natural Wonders: The Ultimate List of Scenic Splendor. Learn more about Jeju Island and other unforgettable places in South Korea by going on our many Package Tours. Contact us now at All Seoul Tours for more details on how to make your visit to Korea a truly memorable experience. 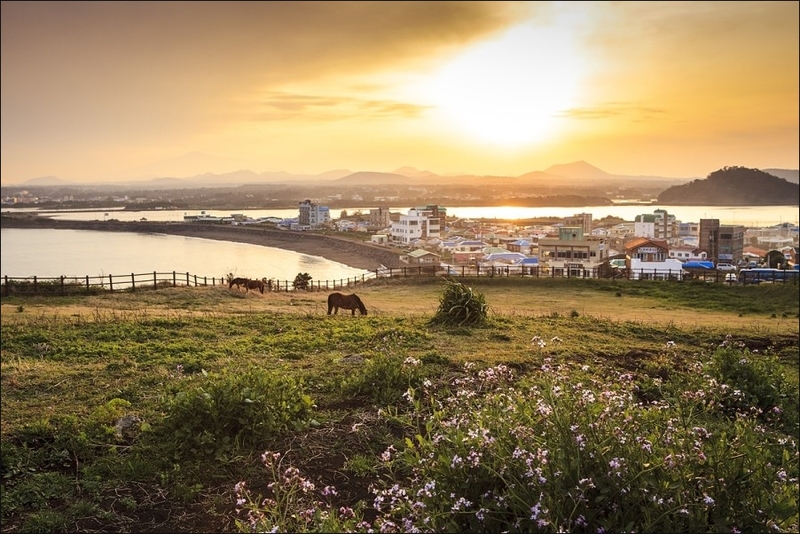 Jeju Island is an oval-shaped volcanic island with 1,950 meter Hallasan Mountain in the middle. The island is 73 km from west to east and 31 km from north to south. Jeju which was created by volcanic activity is known for its unique volcanic features, and the entire island itself is like a volcanic museum. There are 368 oreum on the island (※ oreum: It means ‘small mountain’ in Jeju dialect) and over 160 lava tubes are scattered on the island. It’s very rare to see a small island that has both oreum and caves in the world. The value of Jeju was proved as the island received as the island was designated Biosphere Reserve in 2002, World Natural Heritage in 2007 and Global Geopark in 2010, making the sub-tropical island only place on Earth to receive all three UNESCO designations in natural sciences. Jeju has now become a ‘treasure island of environmental assets’ that the world has to preserve.